Part 1 Foodborne pathogen surveillance and outbreak investigation: Surveillance for foodborne pathogens in humans; Systems for real-time, linked foodborne pathogen surveillance; Detection, investigation and control of outbreaks of foodborne disease; Attributing the burden of foodborne disease to specific sources of infection; Determining the economic costs and global burden of foodborne disease. Part 2 Subtyping of foodborne pathogens: Phenoytypic subtyping; Pulsed-field gel electrophoresis and other commonly used molecular methods; Emerging bacterial subtyping methods; Development, validation and quality assurance of subtyping methods. Part 3 Molecular methods, genomics and other emerging approaches in the surveillance and study of foodborne pathogens: Sample preparation for detection by molecular biological methods; A comparison of molecular technologies and genomotyping for tracing and strain characterisation of Campylobacter isolates; Investigating foodborne pathogens using comparative genomics; Protein-based analysis and other new and emerging non-nucleic acid based methods; Virulotyping; Using ribotyping to trace foodborne aerobic sporeforming bacteria in the factory: A case study; Biotracing: A novel concept in food safety integrating microbiology knowledge, complex systems approaches and probabilistic modeling. Part 4 Tracing pathogens in particular food chains: Red meat and game production chains and the abattoir; Fish production chains; Poultry and egg production chains; Dairy production; Molluscan shellfish production chains; Fruit and vegetable production chains. Successful methods for the detection and investigation of outbreaks of foodborne disease are essential for ensuring consumer safety. Increased understanding of the transmission of pathogens in food chains will also assist efforts to safeguard public health. Tracing pathogens in the food chain reviews key aspects of the surveillance, analysis and spread of foodborne pathogens at different stages of industrial food production and processing. Part one provides an introduction to foodborne pathogen surveillance, outbreak investigation and control. Part two concentrates on subtyping of foodborne pathogens, with chapters on phenoytypic subtyping and pulsed-field gel electrophoresis, as well as emerging methods. The vital topics of method validation and quality assurance are also covered. The focus in Part three is on particular techniques for the surveillance and study of pathogens, such as protein-based analysis, ribotyping and comparative genomics. Finally, Part four focuses on tracing pathogens in specific food chains, such as red meat and game, dairy, fish and shellfish. 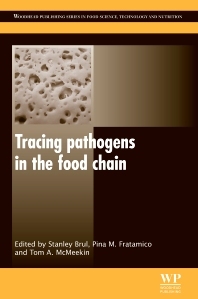 With its distinguished editors and international team of contributors, Tracing pathogens in the food chain is a standard reference for researchers, public health experts and food industry professionals concerned with the study and control of foodborne disease. Stanley Brul is Professor of Molecular Biology at the University of Amsterdam. Tom McMeekin is Emeritus Professor of Microbiology at the University of Tasmania.